A Solitary Man is a new film from directors Brian Koppelman and David Levien, following a middle-aged businessman for whom a worrisome diagnosis prompts a shameful decade-long midlife crisis. We, the audience, enter the film toward the end of this crisis, when bad behavior has become a committed lifestyle. And though you may feel like you're watching a slow-motion car crash, it's actually ripe with humanity... not in our protagonist, who seems intent on abandoning every shred of self-respect, but rather in the people who surround him, who make something salvageable out of his sad life. 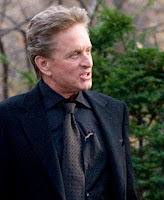 A quintessential train wreck, Ben Kalman (Michael Douglas) shows us the reality of self-sabotage, which, for those going through it, never really exists, because you have to be in denial to stay on such a collision course with disaster. Does Ben make this kind of self-annihilation look good? Obviously it doesn’t look good to all the people around him, and obviously its reverberations upset the ground of his loved ones’ lives, but still, in casting Douglas and making him so successful at his particular addiction, don’t we kind of romanticize this form of behavior? And by making him a human being with a chance of recovery, do we perhaps suggest something even more sinister: that only through a crash-course toward suicide can we really be saved, redeemed, and ultimately fulfilled? Cheston (Jesse Eisenberg) is an answer to this question, but he doesn’t quite resolve it. He's the foil for Ben, having the untwisted, uncorrupted mind of a liberal teenage optimist. However, he also provides additional validation for Ben’s behavior, creating an opportunity for him to become a mentor and channel his carefully-honed bad habits. Cheston may show us that honesty and innocence are their own rewards, but in his transparency, he's rather simplistic, like a team we root for in a particular game because they're the underdog, but don't bother following through the rest of the season. Obviously, Cheston isn't the focus... Ben Kalman is the focus, and we the audience are positioned in relation to him. Ben Kalman induces a rare emotional response: a sort of sympathetic contempt, as we're led to see him embodying the worst parts of tragically flawed people. He's a recognizable, well-acted, almost archetypal slimy businessman who's nasty to people as a way of protecting his own soft underbelly. In seeing this, we, the audience, are put in a very specific place with regards to Ben. We understand him, we see that he's human, and we can be frustrated with him to the point of hopelessness, but we still want him to recognize his own flaws and redeem himself. This brings out the massive importance of his daughter Susan (Jenna Fischer), whose point of view is closest to our own. She's lived with her father for years, and has tried to help him, offer him second chances, and see him compassionately but honestly. We, as the audience, only know him for a couple hours, but we get enough insight into his past and the trajectory of his personal life that we develop an emotional stake in his health and well-being. In terms of familiarity, we may be closer to Jimmy Merino (Danny DeVito), who seems to want to help him simply because he's a human being deserving of mercy, but in terms of investment, Susan is our true stand-in. Despite the film's downbeat tone, this point of view is a fairly safe and optimistic one. Think what a film would be like if it empathized more with Gary (David Costabile) or Jordan (Mary Louise Parker), both of whom see Ben as utterly unredeemable. They may be part of the same life story, but their position is totally different -- instead of compassion and redemption, which are basically spiritual outcomes, they seek containment and retribution, which are more like judicial outcomes. If we'd been placed in this position as an audience, we would truly be alienated from our protagonist, and it would be a very audacious thematic move, akin to Anton Corbijn's 2007 Ian Curtis biopic Control. It seems like it would be simplest to tell this tale through the eyes of Kalman himself. This would put us in a world where young women are tokens of heroism and success, where the enemies are unsympathetic investors and disloyal bankers and shrewd girlfriends, and where ultimate success is an elusive sort of male dominance in the midst of a maelstrom of misfortune. But this point of view, assuming such a point of view is possible, would have meant abandoning one of the film's central insights: that every character is a product of all those judgments and opinions surrounding and affecting them. So you could take the film's title, A Solitary Man, as an ironic one. As much as he tries to isolate himself, perhaps in pursuit of an unattainable sense of manly wholeness, Ben Kalman remains a product of the frustration, compassion, and contempt he inspires. And though he may not find redemption for himself, he attains it at a few key moments, through his daughter, who offers him a hand at his most difficult moment, and through us, his audience, who are human enough to hope he can eventually redeem himself.